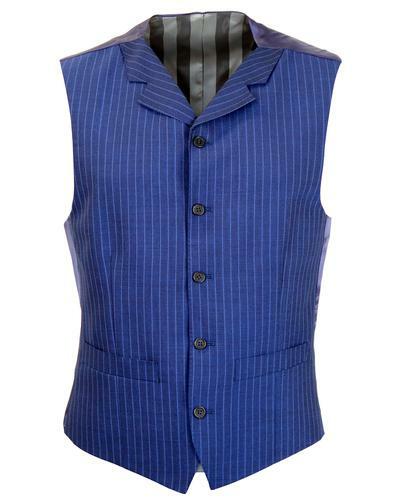 Madcap England 'Electric Pinstripe' Men's tailored Mod high fasten waistcoat with Retro notch lapel. Perfect for adding a twist of 1960s Dandy-esque charm to your formal ensemble, this fab 'Electric Pinstripe' waistcoat pitches a flash of colour with a reserved and sophisticated look. Slim cut vest with single breasted fastening and sublime internal details for extra Retro effect! 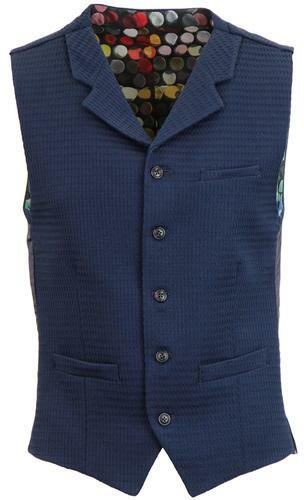 Madcap England 'Electric Pinstripe' Men's Sixties Mod tailored high fasten waistcoat. The striking electric blue pinstripe detail is the perfect contrast to the dark navy ground and is complimented by the shimmering green stripe lining. Plain navy back panel with traditional Retro tab adjuster. The stylish notch lapel detail conjures up images of 1960s Mod culture with a hint of 1920's Gangster styling thrown in to boot. Two pockets to sides, 5 button fastening, exquisite shaped point hem. Retro rust piping trim to interior. 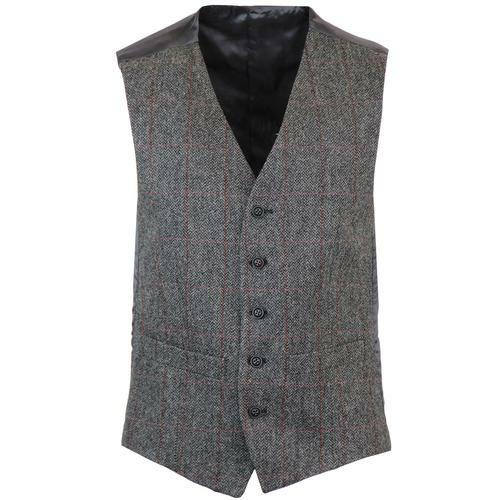 The perfect tailored Mod waistcoat. 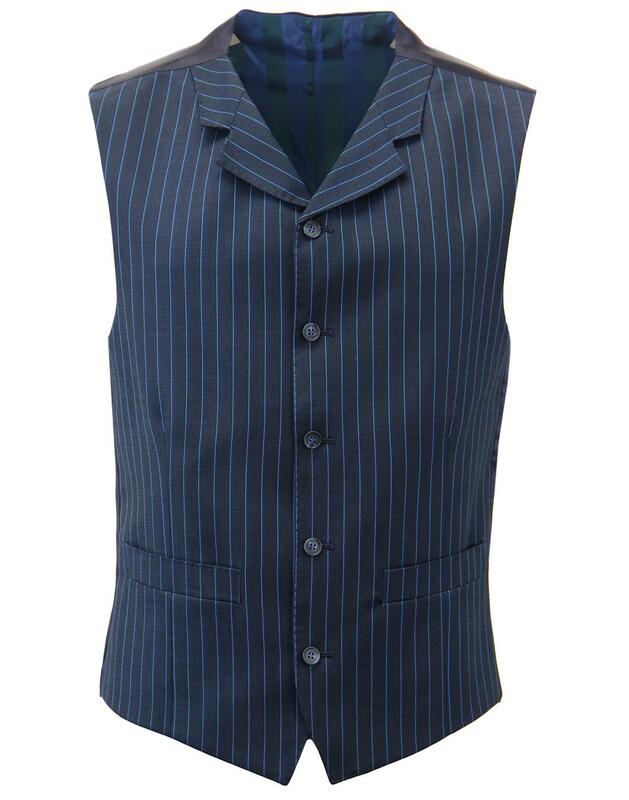 Match this Madcap England Electric Pinstripe Waistcoat with matching Mod 3 button blazer and Retro slim leg trousers to create the ultimate 3 piece suit. 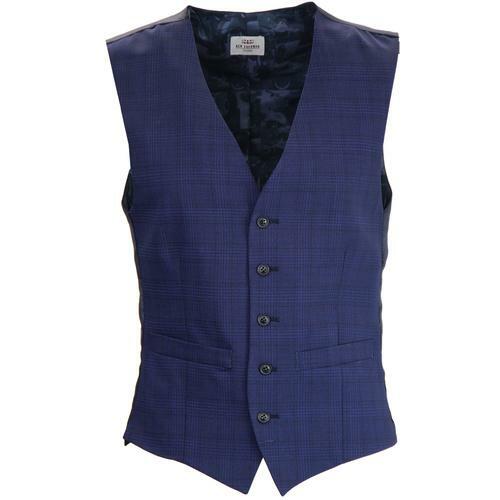 Key Points: Madcap England 'Electric Pinstripe' 5 Button high fasten waistcoat with notch lapel, pockets and tab adjuster to back panel. Composition: 50% Wool, 50% Polyester. Lining 1: 51% Viscose, 49% Acetate. Lining 2: 50% Viscose, 50% Acetate. Lining 3: 100% Viscose.